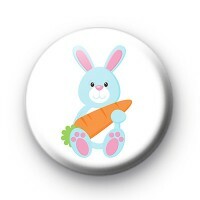 A super cute Easter bunny badge featuring an illustration of a blue Easter bunny eating a massive orange carrot on a white badge. We sell loads of Easter badges each year & they are the perfect thing for primary school teachers to hand out to their pupils. They can be pinned to school jumpers and ties and allow you to have a bit of fun in class over the Easter period. They are also great as merit items & prizes. They are hand made by us in our UK workshop using hand press badge machines & British badge parts. Standard 25mm button badge with a copper pin back.